Easy, hearty Breakfast Enchiladas stuffed with your favorite breakfast ingredients then smothered with intoxicatingly delicious Creamy Salsa Sauce! These enchiladas are totally customizable, perfect for your leftover holiday ham AND you can assemble the night before and bake the next day. but most importantly, they are lick your plate gooooood! 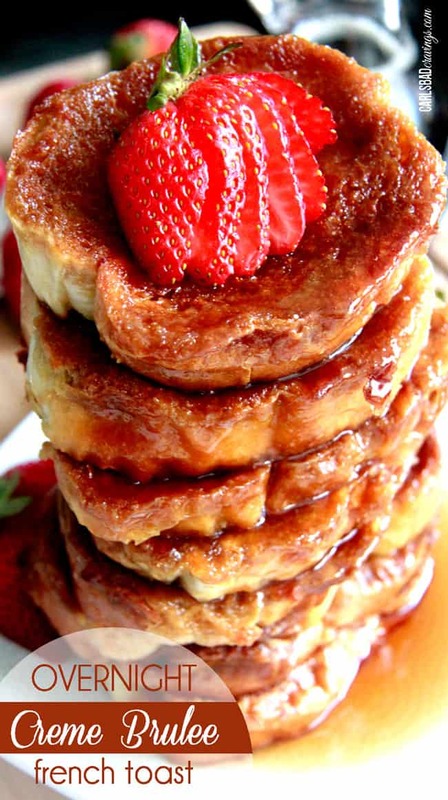 I am not really a breakfast food type of person unless its special occasion breakfasts like Overnight Creme Brulee French Toast and Cream Cheese Stuffed Banana Bread Coffee Cake. Otherwise, I’d rather greet the morning by devouring leftovers. Even as a little girl, I’d skip the cereal and oatmeal and dive mouth first into leftover Waikiki Meatballs, Roast or Chicken Divan. Savory food is my happy place. 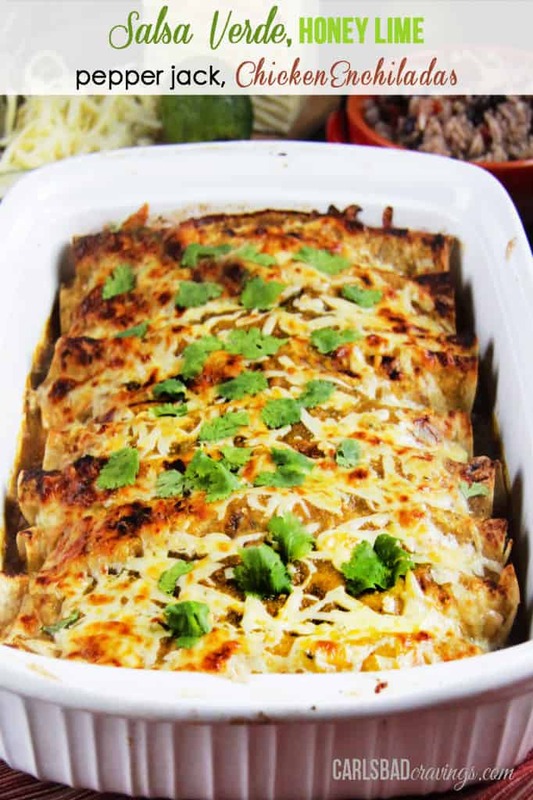 And savory, hearty, cheesy, Mexican food – better yet – enchiladas for breakfast – is my happier place! I think these Breakfast Enchiladas will make you and your family very happy too. 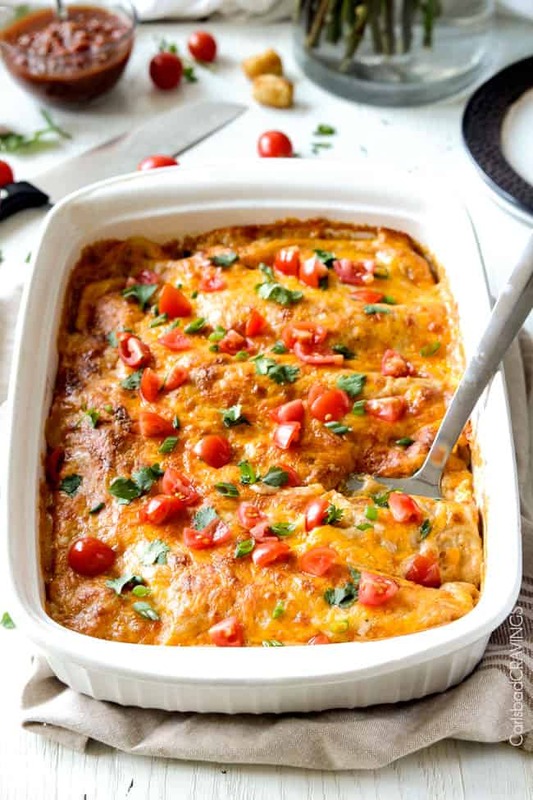 These Breakfast Enchiladas are a fabulous assemble ahead casserole, perfect for this upcoming holiday week, and doubly perfect because you can use up some of your leftover ham. And even though my Brown Sugar Glazed Ham and Baked Ham with Cider Maple Glaze are incredible, you will likely have leftovers. And hopefully enough leftovers for both these Breakfast Enchiladas and my White Bean Ham Tortellini Soup that’s out of this world. So ration accordingly. Or buy more ham. 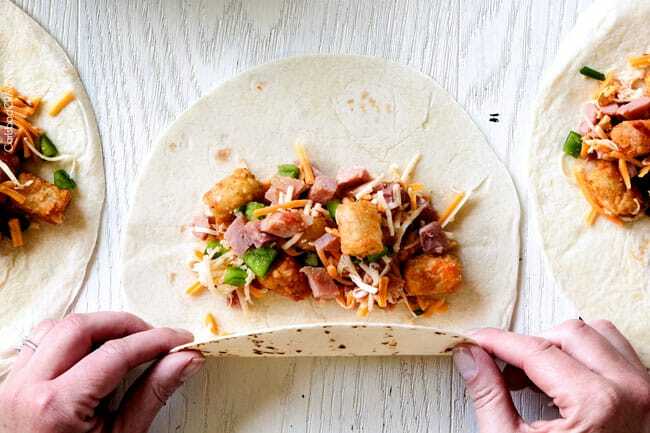 The tater tots selection was inspired by my recent California Carne Asada Burrito at Bull Taco that was overflowing with tater tots instead of the typical French Fries – incredible. 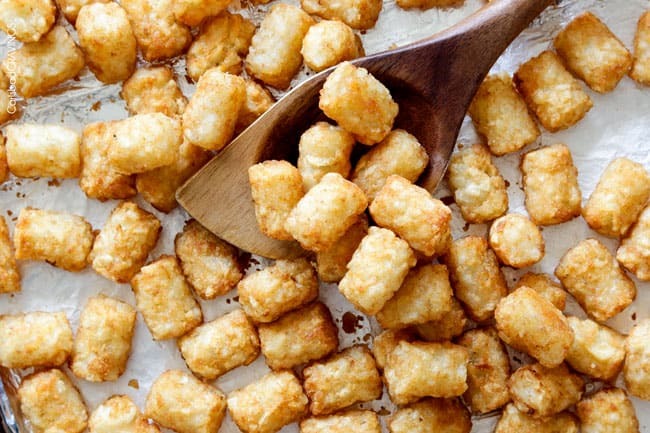 The tater tots stay crispier than fries or hash browns, so I highly recommend them – and it gives you the excuse to buy tater tots! I think its been over a decade since I baked up a package of those happy little morsels. Loooong overdue. 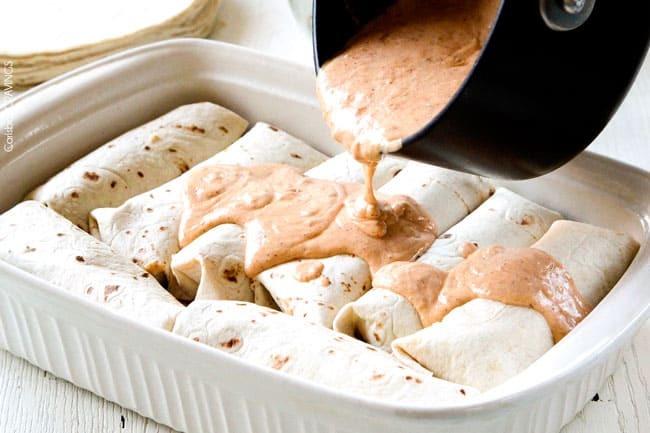 You can pile your flour tortilla with the mixture the night before and wrap up so all you have to do in the morning is make your Creamy Salsa Sauce. That gets baked until oozy, bubbly, golden perfection. Now all that’s left to do is top these Breakfast Enchiladas with your favorite garnishes – tomatoes, avocado, cilantro, sour cream, etc. And dig in – any time of day…breakfast, lunch, or dinner! 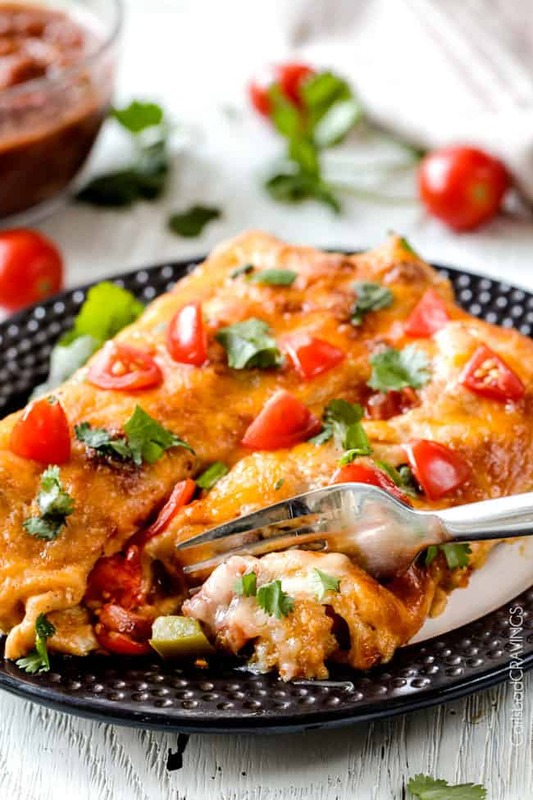 Breakfast Enchiladas, so you devour satisfyingly delicious cheesy Mexican food for breakfast. happy. day. and Happy Merry Christmas Eve!!! Bake tater tots according to package directions, broiling at the end so they are extra crispy. Creamy Salsa Sauce: Meanwhile, in a medium saucepan, melt butter in olive oil over medium heat. Sprinkle in flour and cook for 3 minutes (it will be thick). Reduce heat to low and slowly whisk in chicken broth until smooth followed by spices. Bring to a boil and simmer until slightly thickened. Remove from heat and stir in salsa and sour cream. Set aside. 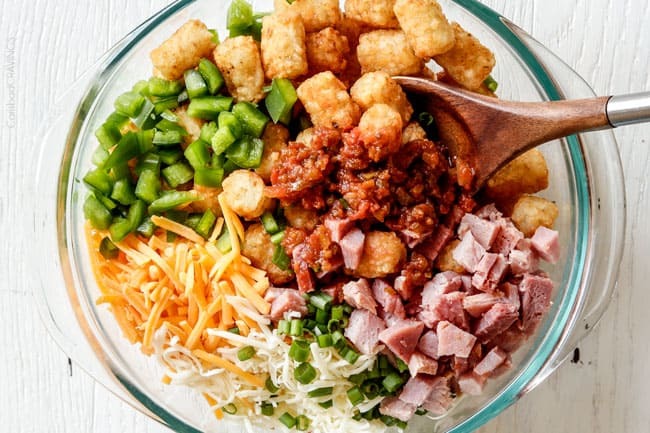 Enchilada Filling: In a large bowl, combine ham, peppers, green onions, tater tots, 1 cups Pepper Jack Cheese, 1 cup cheddar cheese and 1/4 cup salsa. Assemble: Preheat oven to 350 degrees F. Spread 1/3 cup Creamy Salsa Sauce on the bottom of a lightly greased 9x13 baking dish (layer will be very thin). Evenly divide enchilada filling between tortillas then roll them up tightly burrito style, then line them in the dish. 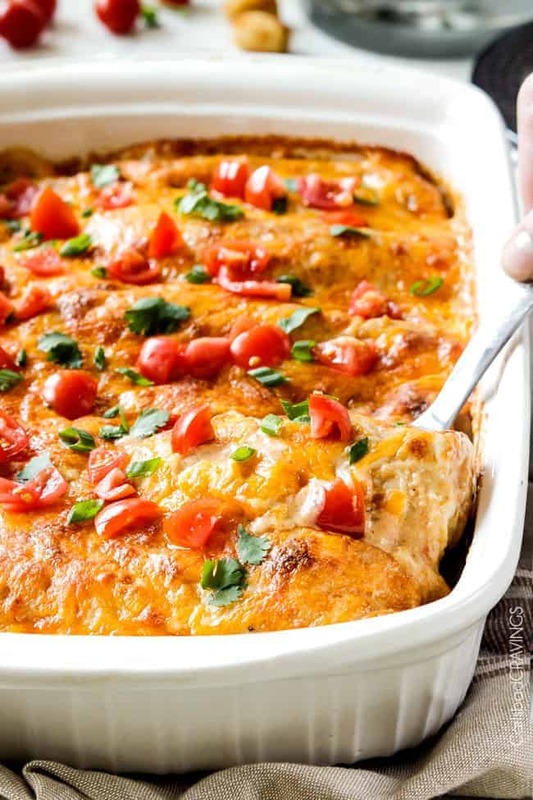 You can cover and refrigerate at this point to bake later OR Top enchiladas with remaining Creamy Salsa Sauce and remaining cheeses and proceed to bake. Bake uncovered at 350 degrees F for 30 minutes then broil until cheese is golden. Top with desired garnishes. 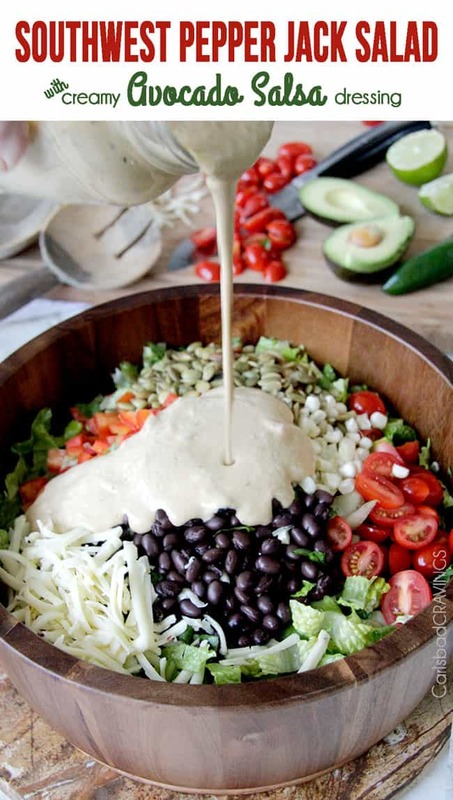 **If assembling the night before, line 9x13 with enchiladas but do not pour Creamy Salsa Sauce over the top. Refrigerate Sauce separately. 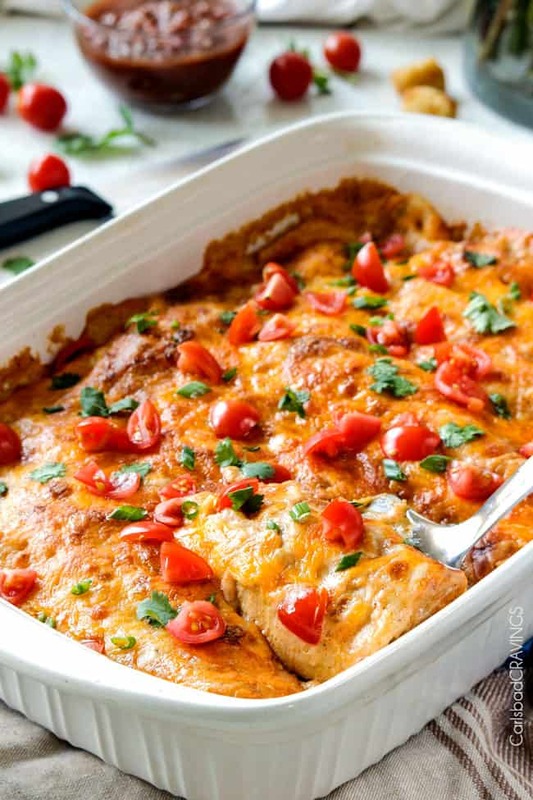 When ready to bake/serve, heat Creamy Salsa Sauce just until warm in the microwave or stovetop, thinning if needed after warming, then continue to pour over enchiladas and bake according to directions. Boy do these look and sound sensational. LOVE the tots inside, too. Funny, it must be a ham and cheese kind of season. The last 2 days I’ve seen plenty of good stuff. 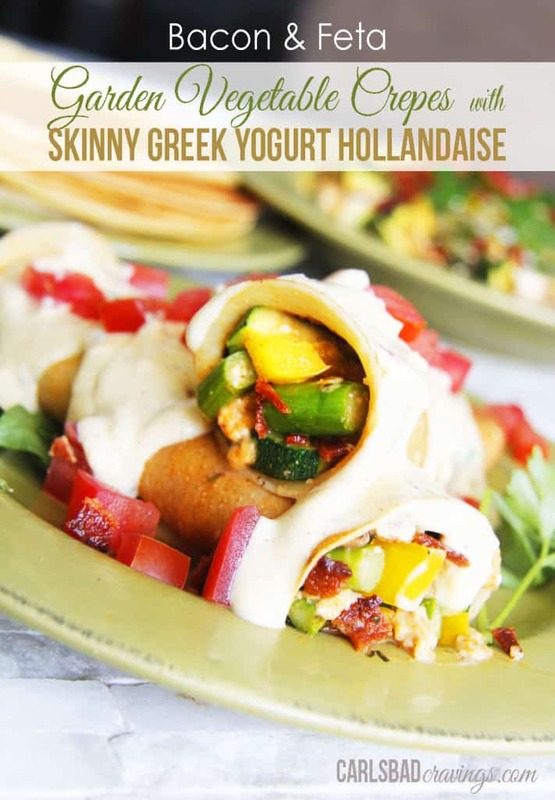 My gosh I could have breakfast three times a day with savory enchiladas. They look so very yummy. I made a breakfast casserole for Christmas morning but honestly you’ve inspired me to make a casserole for breakfast throughout the year. I really like the idea of preparing the night before and just cooking in the morning. Thank you for the recipes and I hope you had a very Merry Christmas!! I hope you had a very Merry Christmas as well Marisa! 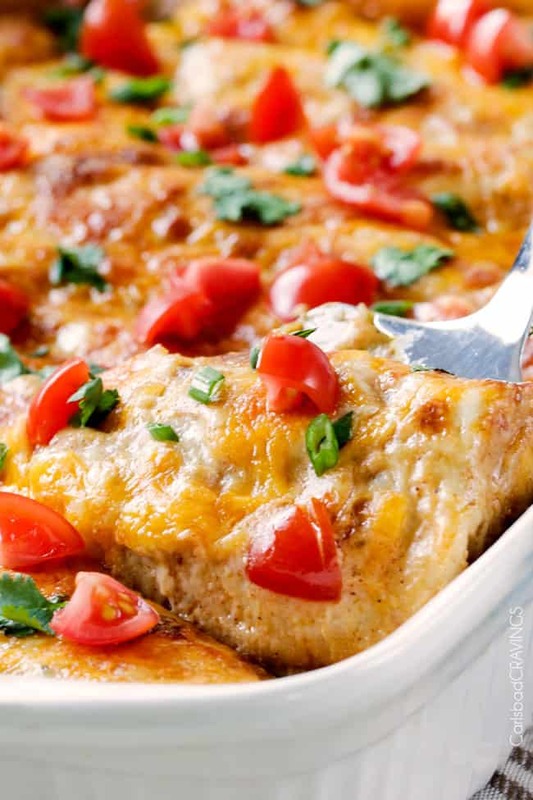 I love savory breakfast casseroles too and you are so right – they are something to eat all year long – and all day long 🙂 I am sure your breakfast casserole was delish!! Certainly wish I had made these for Christmas morning! The gang wanted the traditional monkey bread/sticky buns again! Was so “sweeted”out after 2straight weeks of treat creating!!! AYE YAY YAY! Hope your Christmas was grand. Best wishes to you and your family for a Fantastic, Blessed, Healthy, and Prosperous New Year! Saw a neighbor walking her dog yesterday, and it looked so much like KIWI! WANT A kiwi! Adorable! Anyway, thanks for being so kind, and blessing us through such hard work, with amazing recipes and lovely reads! The year began so rough, was so sick. Is ending in the most miraculous fashion! So thankful and so humbled by the kindest, talented, and giving people I have “met”through there blogs. You, most prominently, are very special in this world! Hugs to you!! Just a quick question for you. 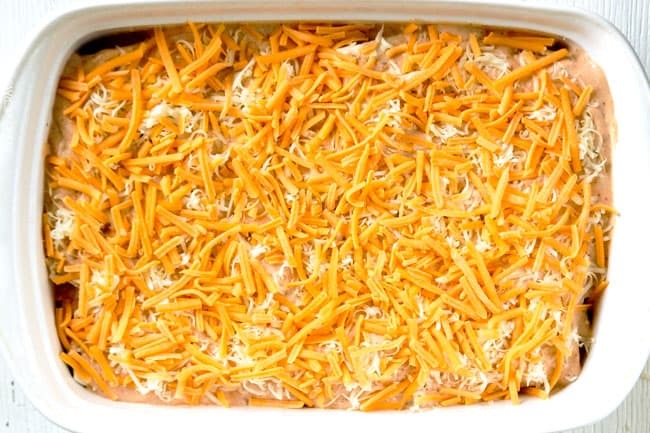 Could this enchilada casserole be made ahead of time and frozen, then just thawed the night before popping in the oven? I am all about having my freezer full when “the kids” come up for weekends. By the way, have you considered writing a cookbook? I think it would be a best seller and I for one would buy a copy for all of my friends. Every single recipe that I have tried from your blog has the word “WOW” written across the top! 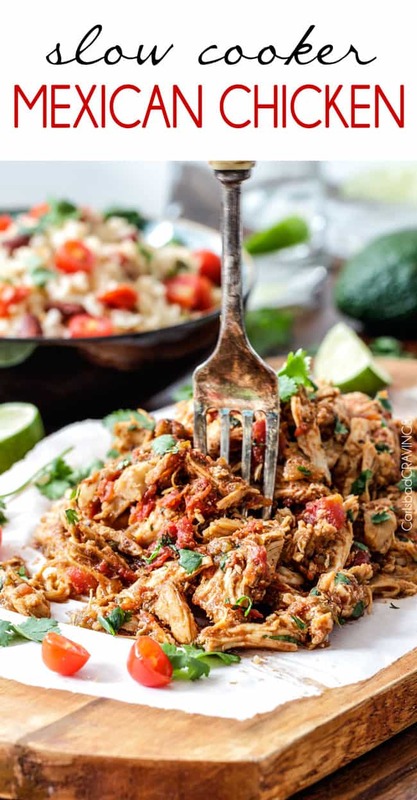 Thanks for sharing such easy and scrumptious recipes! Hi Lynn, thank you so much for your kind words about my recipes and making my day! I am thrilled and honored that all my recipes you have tried have been hits! As far as a cookbook goes, I have been approached several times but I don’t think its for me – or at least right now, but if anything changes you guys will be the first to know! 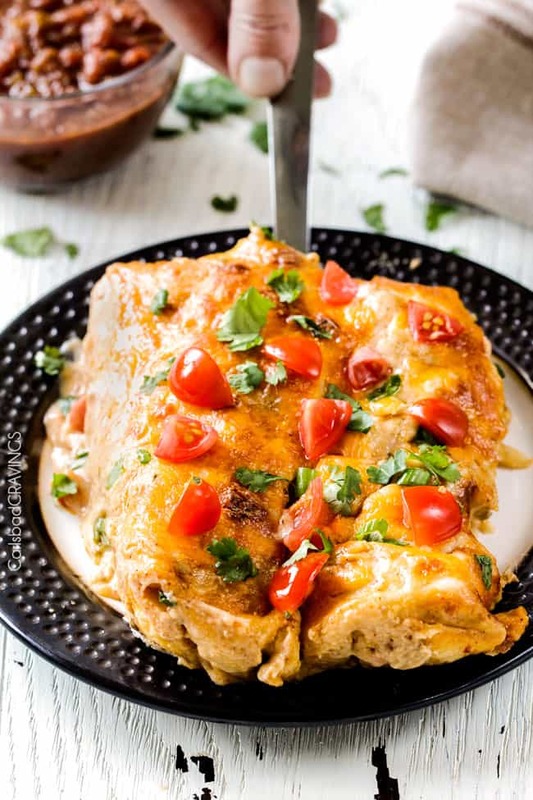 As far as the enchiladas – I think they would make a great freezer meal that the kids would love! Such a great idea! Thanks Lynn, I hope you have a great weekend!